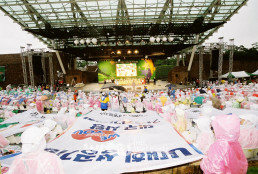 On July 6 (Sunday), 2003, the New Life Family Walkathon was held at Duryu Park in Dalseo-gu, Daegu, in which over 30,000 citizens including the foundation members took part. Wishing for the success of the Daegu Summer Universiade that was planned to be held in August in Deagu, the walkathon played an important role to increase citizens’ interest for the Summer Universiade by walking a total of 3 km from Daegu Technical College to Kolon Outdoor Auditorium located in Duryu Park, including 1 km walk through the center of Daegu city. 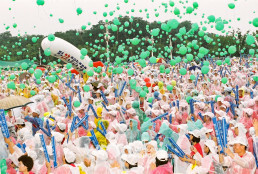 Although the rain poured down, the walkathon went on as it had been scheduled. 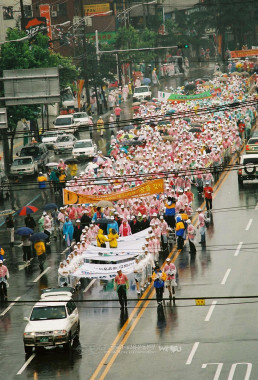 The participants who wore raincoats over their pink T-shirts kept walking briskly. Fathers and mothers who wheeled baby carriages, an elderly lady who painted her face with Taegeukgi (the national flag of Korea), and even a disabled member in his wheelchair joined the walkathon. People said that all the Duryu Park was filled with angels in raincoats. In the walkathon many distinguished figures of various social standing took part: Park Sang-ha the Executive President of the Daegu Universiade Organizing Committee, Lawmaker Kim Il-yun, and Lawmaker Kim Bu-gi. Yun Seok-gi the Chief of the Victims’ Family of Daegu Subway Arson Attack, and five measure committee members quietly attended the event. 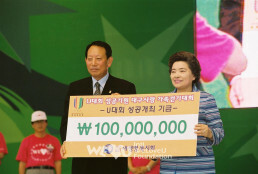 The New Life Welfare Foundation Chairwoman Zahng Gil-jah said in the interview by KBS that she arranged this walkathon to lead the Daegu Summer Universiade to a success and to offer a cultural program for the youth in need. She also said about the purpose of the event, “I hope that today’s event will revitalize Daegu City which is depressed recently for several tragic accidents.” The New Life Welfare Foundation delivered admission tickets for the Universiade opening ceremony to the youth in need.